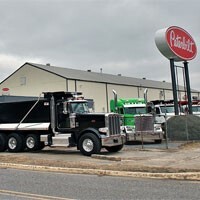 The powerful and versatile Peterbilt 365 is built to meet the daily challenges of mixer duty, construction sites and virtually any vocational application. The lightweight, all-aluminum cab with lap seam construction, aircraft grade fasteners and bulkhead style doors is legendary for its durability. With a compact 115-inch BBC, the Model 365 features improved ride and handling and increased maneuverability. The pod-mounted headlamps are durable, corrosion-resistant and cost-effective to replace. They feature halogen bulbs for longer bulb life and outstanding nighttime visibility. 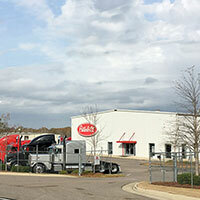 The Peterbilt Model 365 natural gas platform vehicles are available with a choice of two engines. The Cummins Westport ISL G 8.9 liter engine offers a 320-horsepower rating and 1,000 lb-ft of torque and provides an extremely efficient fuel-to-power ratio. Also now available is the Cummins Westport ISX12 G with ratings from 320-400 horsepower and 1,150-1,450 lb-ft of torque. 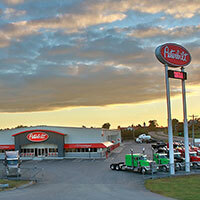 These efficient and emissions compliant compressed (CNG) or liquefied natural gas (LNG) power platforms join Peterbilt’s family of on-highway vehicles and alternative fuel vehicles, forming the industry’s most comprehensive environmentally responsible lineup. The PACCAR MX-13 superior power platform has been integrated into Peterbilt’s best-in-class vehicles to provide customers maximum power and outstanding fuel efficiency to optimize performance in virtually any application. 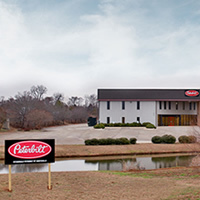 The combination of a Peterbilt truck and MX-13 Engine offers long-term value through technologically advanced designs with lightweight materials that achieve excellent performance and superior fuel economy. The MX-13 provides longer service intervals, increased uptime, lower operating costs and higher resale value. The Model 365 is available in both a set-forward front axle configuration for a smoother ride or a set-back front axle for increased maneuverability and optimized weight distribution. 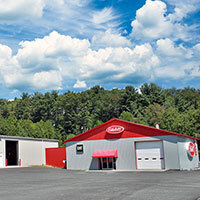 Set-back front axle configurations are available with FEPTO provisions, including a stationary grille, and are also available with set-forward or set-back REPTO provisions for versatility with job-specific applications. The addition of the multiplex electrical system furthers the versatility by offering diagnostic simplicity and reliability. The 365 is also available on an alternative fuel configuration with the fuel-efficient and powerful Cummins ISL G engine. Dana Spicer Single – 21-30K lbs. Dana Spicer Tandem – 40-70K lbs. Dana Spicer Tridem – 69K lbs. Meritor Single – 21-23K lbs. Meritor Tandem – 40-46K lbs. Meritor Tridem – 66K lbs.